As you know, our Drink of the Week is the Manhattan. 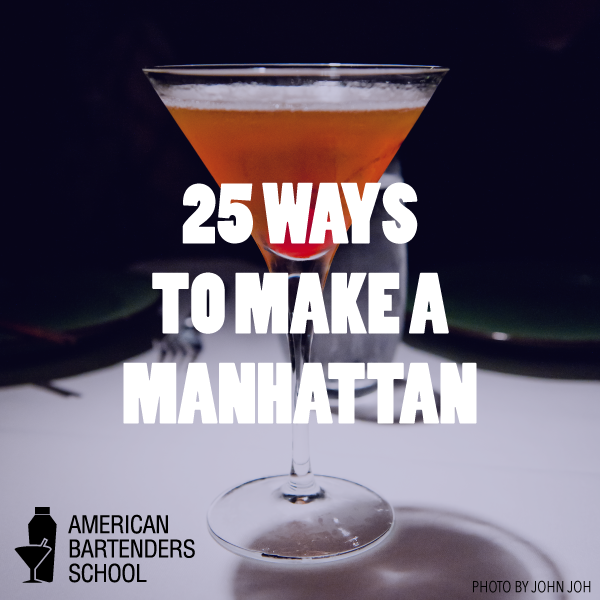 We’ve scoured the internet for this list and put together the top 25 ways to make a Manhattan. Please drink responsibly. There are definitely other ways to create the famous cocktail, but these are the ones we think are best. 2. Dry Manhattan- Use a dash of dry vermouth and garnish with a lemon twist. 3. Perfect Manhattan- Equal parts of sweet and dry vermouth. Garnish with a lemon twist. 4. Brandy Manhattan- Replace whiskey with brandy. 5. Scotch Manhattan- Replace whiskey with Scotch. 6. Dry Scotch Manhattan – same as above, hold the bitters. 7. Southern Comfort Manhattan- Replace whiskey with Southern Comfort. 12. Sherman – Keep the Angostura in, add a dash of orange bitters and 3 dashes of absinthe. 13. Jumbo – Equal parts of rye, French vermouth, and Italian vermouth, no bitters. 14. Honolulu – equal parts bourbon, French vermouth, and Italian vermouth. No bitters. 15. Rosemary – Half bourbon and half French vermouth. 16. Brown University – Half bourbon and half French vermouth, with a couple dashes of orange bitters. Combine rye, vermouth, Cardamaro, and bitters in a cocktail shaker filled with ice. Shake and strain into a chilled martini glass; garnish with cherry. Combine bourbon, vermouth, and bitters in a cocktail shaker filled with ice. Shake and strain into a chilled martini glass; garnish with cherry. Combine rye, vermouths, and bitters in a cocktail shaker filled with ice. Shake and strain into a chilled martini glass; garnish with cherry. Combine bourbon, Cynar, vermouth, and bitters in a cocktail shaker filled with ice. Shake and strain into a chilled martini glass; garnish with cherry. Place the bourbon, Pelinkovac, vermouth, and bitters into a shaker over ice and shake well. Pour the mixture into a barrel and age it for about a month before serving. 2. Combine rye, vermouth, and ¾ oz. (1½ tbsp.) massaman syrup over ice. Stir for 30 seconds, or until very well chilled. Strain into a lowball glass. Top with two or three dashes of bitters, and garnish with orange zest. Mix whiskey, vermouth, Chartreuse, and bitters in a shaker with ice; stir to chill. Strain into champagne coupe. 25. The Only Manhattan You’ll Ever Need – from Thrillist. This one was created by a man named Joaquín Simó, who was Bartender of the Year. This one is more about the preparation than the ingredients. Watch the video to learn the technique that Mr. Simó recommends.